The root of a plant is that portion which is usually found in the earth, the stem and leaves being in the air. The point of union is called the collar or neck of the plant. The fibrous root is one composed of many spreading branches, as that of barley. 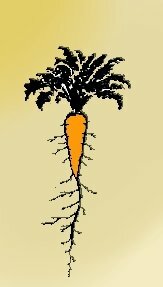 A conical root is one where it tapers regularly from the crown to the apex, as that of the carrot. 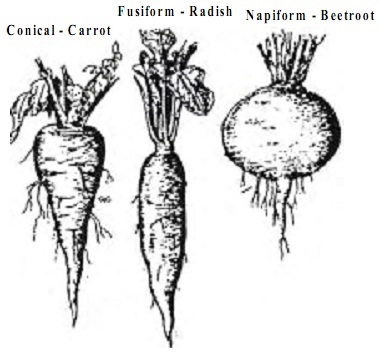 A fusiform root is one when it tapers up as well as down, as that of the radish. A napiform root is one when much swollen at the base, so as to become broader than long, as that of a turnip. A fasciculated root is one when some of the fibers or branches are thickened. A tuberiferous root is one when some of the branches assume the form of rounded knobs, as the potato. A palmate root is one when these knobs are branched. Aerial roots are those emitted from the stem into the open air, as that of Indian corn. A rhizome, or root stock, is a prostrate stem either subterranean or resting on the surface, as that of calamus, or blood-root. A tuber is an enlargement of the ape of a subterranean branch of the root, as that of the common potato or artichoke. A cormus is a fleshy subterranean stem of a round or oval figure, as in the Indian turnip. A bulb is an extremely abbreviated stem clothed with scales, as that of the lily. The stem is that portion of the plant which grows in the opposite direction from the root, seeking the light, exposing itself to the air. All flowering plants possess stems. In those which are said to be stemless, it is either very short, or concealed beneath the ground. An herb is one in which the stem does not become woody, but dies down to the ground at least after flowering. A shrub is a woody plant, branched near the ground and 1 to 6 feet tall. Those stems which are too weak to stand erect are said to be decumbent, procumbent and prostrate. That the reader may more intelligently understand the description of the medicinal plants on this site, the author has deemed it prudent to preface the part of this work dedicated to herbal materia medica with a brief analysis of the plant, as made by the botanist. This becomes particularly necessary , inasmuch as a plant cannot be accurately described unless scientific language is used: but , nevertheless, throughout this whole work it has been the aim of the author to use the plainest language, and not to weary the reader by a pedantic employment of technical terms and scientific language. 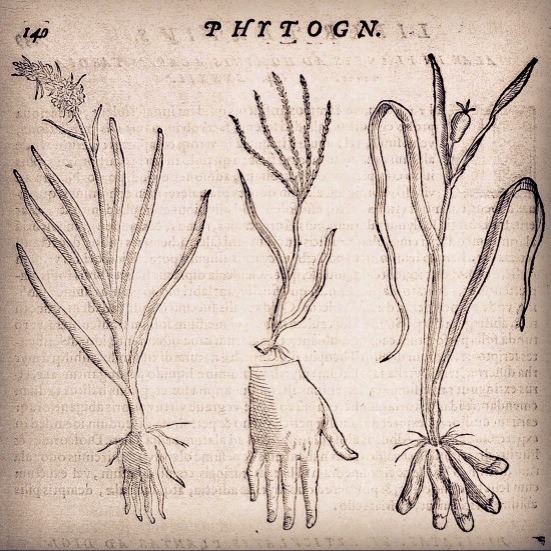 Nothing more will be given than the anatomy of the plant, as nothing of systematic botany need be known to the reader to recognize the plant, or to acquaint themselves the medicinal properties thereof. If they have not a common acquaintance with a medicinal plant, but desires it for domestic medication. It is important that he should know that he employs the proper herb, and not use one which simulates it. It has therefore been the aim of the author to give accurate descriptions of the herbs, so that the gatherer may not err in his selection of the plant which his case may need. Not all parts of the plant are used in medicine, sometimes the seed only: in others the flower, the leaves, root, rhizome; in others two or more of these parts, and again , in others the whole plant. Annual plants spring from the seed, make their full growth and die in one year. A biennial plant does not flower the first year, but produces leaves only. The second year of its growth it flowers, after which it dies. The carrot and parsnip are examples of biennials. A perennial plant lives for more than two years. If the plant retains its leaves during the winter , it is known as an evergreen; if the leaves fall upon the approach of cold weather, it is said to be deciduous. An herb is a plant having a soft stem which dies down to the ground after the plant has reached its full growth. A shrub is a plant which has a woody stem, grows to a height of 25 to 30 feet and branches near the ground. A tree has a woody stem, is higher than a shrub and does not branch near the ground. A stolon is a form of a branch which curves or falls down to the ground, where they often strike root. A sucker is a branch of the subterraneous origin, which, after running horizontally and emitting roots in its course, at length rises out of the ground and forms an erect stem, which soon becomes an independent plant, as illustrated by the rose, raspberry, ect. A runner is a prostrate, slender branch sent off from the base of the parent stem. An offset is a similar but shorter branch , with a tuft of leaves at the end, as in the house-leek. A spine is a short and imperfectly developed branch of a woody plant, as exhibited in the honey-locust. A tendril is commonly a slender leafless branch, capable of coiling spirally , as in the grape vine. The leaf is commonly raised on an unexpanded part or stalk which is called the petiole, while the expanded portion is termed the lamina, limb or blade. When the vessels or fibers of the leaves expand immediately o leaving the stem, the leaf is said to be sessile. In such case the petiole is absent. When the blade consists of a single piece the leaf is simple: when composed of two or three more with a branched petiole, the leaf is compound. The distribution of the veins or framework of the leaf in the blade is termed venation. A lanceolate leaf has the form of a lance. An ovate leaf has the shape of ellipsis. A cuneiform leaf has the shape of a wedge. A cordate leaf has the shape of a heart. A sagittate leaf is arrow-shaped. A hastate leaf has the shape of an ancient halberd. A peltate leaf is shaped like a shield. A serrate leaf is one in which the margin is beset with sharp teeth, which point forward towards the apex. A dentate leaf is one when these teeth are not directed towards the apex. A crenate leaf has rounded teeth. A sinuate leaf has alternate concavities and convexities. A pinnate leaf has the shape of a feather. A pectinate leaf is one having very close and narrow divisions, like the teeth of a comb. A lyrate leaf has the shape of a lyre. A runcinate leaf is a lyrate leaf with sharp lobes pointing towards the base, as in the dandelion. A palmate leaf is one bearing considerable resemblance to the hand. A pedate leaf is one bearing resemblance to a bird's foot. A obovate leaf is one having the veins more developed beyond the middle of the blade. When a leaf at its outer edge has no dentations it is said to be entire. When the leaf terminates in an acute angle it is acute, when in an obtuse angle it is obtuse. An obtuse leaf with the apex slightly depressed is retuse, or if more strongly notched, emarginate. An obovate leaf with a wider or more conspicuous notch at the apex becomes obcordate, being a cordate leaf inverted. When the apex is cut off by a straight transverse line the leaf is truncate: when abruptly terminated by a small projecting point it is mucronate; and when an acute leaf has a narrowed apex it is acuminate. In ferns the leaves are called fronds. The flower assumes an endless variety of forms, and we shall assume in dissection merely the typical form of it. The organs of the flower are of two sorts, viz: first, its leaves are envelopes; and second, those peculiar organs having no resemblance to the envelopes. The envelopes are of two kinds, or occupy two rows one above or one within the other. The lower or outer row is termed the Calyx, and commonly exhibits the green color of the leaves. The inner row, which is usually of more delicate texture and forms the most showy part of the flower, is termed the Corolla. The several parts of the leaves of the Corolla are called petals, and the leaves of the Calyx have received the analogous name of Sepals. The floral envelopes are collectively called the Perianth. The essential organs enclosed within the floral envelope are also of two kinds and occupy two rows one within the other. The first of these, those next within the petals, are the Stamens. A stamen consists of a stalk called the filament, which bears on its summit a rounded body termed the Anther, Filled with a substance called the Pollen. The seed-bearing organs occupy the center of summit of a flower, and are called Pistil's. A pistil is distinguished into three parts, viz: first the Ovary, containing the Ovales; Second the Style, or columnar prolongation of the ovary; and third the Stigma, or termination of the style. All the organs of the flower are situated on, or grown out of the apex of the flower-stalk, into which they are inserted, and which is called the Torus or Receptacle. A plant is said to me monoecious, where the stamens and pistile are in separate flowers on the same individual, dioecious, where they occupy the separate flowers on different individuals, and polygamous were the stamens and pistils are separate in some flowers and united in others, either on the same or two or three different plants. A follicle is the name given to such a fruit as borne by the larkspur or milkweed. A legume or pod is the name extended to such fruit as the pea or bean. A drupe is a stone fruit, as the plum, apricot, etc..
An achenium is the name of the fruit as borne by the butter-cup, etc. A cremocarp is the fruit of the poison Hemlock and similar plants. A caryopsis is such fruit as borne by the wheat tribe. A nut is exemplified by the fruit of the oak, chestnut, etc. A samara is the name applied to the fruit of the maple, birch, and elm. A berry is a fruit fleshy and pulpy throughout, as the grape, gooseberry, etc. A pome is such as the apple, pear, ect. A pepo is the name applied to the fruit of the pumpkin, cucumber, etc. A capsule is a general term for all dry fruit, such as lobelia, etc. A silique is such fruit as exhibited in shepherd's purse, etc. A cone or strobile is a collective fruit of the fir tribe, magnolia etc. The seed like the ovule of which it is fertilized and matured state, consists of a nucleus, usually enclosed within two integuments. The outer integument or proper seed coat is variously termed the episperm, spermoderm, or testa. Absorbents or antacids are such medicines that counteract acidity of the stomach and bowels. Alternatives are medicines which,in certain doses, work gradual change by promoting the usual functions of different organs. Anthelmintics are medicines which have the power of destroying or expelling worms from the intestinal canal. Antispasmodics are medicines given to relieve spasm,or irregular and painful action of muscles or muscular fibres. Astringents are those remedies which, when applied to the body, render the solids dense and firmer. Carminatives are those medicines which dispel flatulency of the stomach. Cathartics are medicines which accelerate the action of the bowels or increase the discharge by stool. Demulcents are medicines suited to modify the action of acrid and stimulating matters upon the mucous membranes as in the throat, etc. Diaphoretics are medicines that promote or cause perspirable discharge by the skin. Diuretics are medicines which increase the flow of urine by their action upon the kidneys. Emollients are those remedies which, when applied to the solids of the body, render them soft and flexible. Errhines are substances which, when applied to the lining membrane of the nostrils, occasion a discharge of mucus. Epispastics are those which cause blisters when applied to the surface of the body, forming sloughs. Expectorants are medicines capable of facilitating the excretion of mucus. Narcotics are those substances having the property of diminishing the action of the nervous and vascular systems, and of inducing sleep. Rubefacients are remedies which excite the vessels of the skin and increase its heat and redness. Sedatives are medicines which have the power of allaying the action or of lessening the exercise of some particular function. Sialagogues are medicines which increase the flow of saliva. Stimulants are medicines capable of exciting the vital energy, whether as exerted in sensation or motion. Tonics are those medicines which sharpen the appetite and promote strength and tone. All roots, barks,herbs, leaves, flowers, and bulbs which have a medicinal value are commonly called botanic drugs. In the following pages the most important botanical drugs are described, some of the uses for which they have been or may be employed are given, the valuable part of the plant mentioned, the geographical distribution of the plant stated, and directions for gathering, as well as the best time for doing so. To get the best results from the work of collecting botanical drugs, it is important to handle them properly, as wells to collect at the right time of year. It is also well to see that the articles you collect are not mixed with some of similar appearance. The demand is for pure, clean, properly handled goods, and these only will bring the highest price. Leaves should always be collected in clear dry weather, in the morning, after the dew is off. They are at their best when the plant is in bloom and should be collected at this time. Leaves of biennials are most valuable during the second year of their growth. In drying spread out thinly on a clean floor and stir occasionally until they are thoroughly dry. Remove all stems from leaves and remember that the leaves which are worth the most are those which retain their natural green color. Dampness will turn leaves black, so be careful not to let them get damp. In collecting herbs, strip off the flowers, smaller leaves, and very small stems and reject the large stem. Dry same as leaves. The large woody stems are of no value. Flowers are worth the most, from the standpoint of their medical value, immediately upon opening. The directions for collecting leaves also apply to flowers, which sell best when their natural color is preserved in drying. Bulbs should be gathered at the time the leaves of the plant die, which is of course in the autumn. The outer heavy coat should be removed and the bulb sliced, after which it should be dried by artificial heat, not to exceed 100F. Barks may be gathered either in the fall or spring. Wild Cherry and other rough barks should be rossed before peeling, that is the rough outer bark must be scraped or shaved off, and the inner bark then peeled. Barks may be dried in sunlight, except green Wild Cherry. Seeds should be gathered as soon as they ripen. Only heavy full developed sees are of value: others should be removed by winnowing. The price of botanical drugs is constantly changing and for this reason it would be useless to mention market values in a work of this kind. Never ship goods to a dealer or buyer before getting an order from them. The more valuable and perishable articles should be shipped in boxes, other goods may be shipped in bags. See that all goods are dry before shipping; otherwise they will mold while on the way and be worthless, when they arrive at their destination. It is always best to correspond with buyers before shipping. Mark shipments plainly with your name, the name of the consignee and the name of the article or articles contained in the shipment.